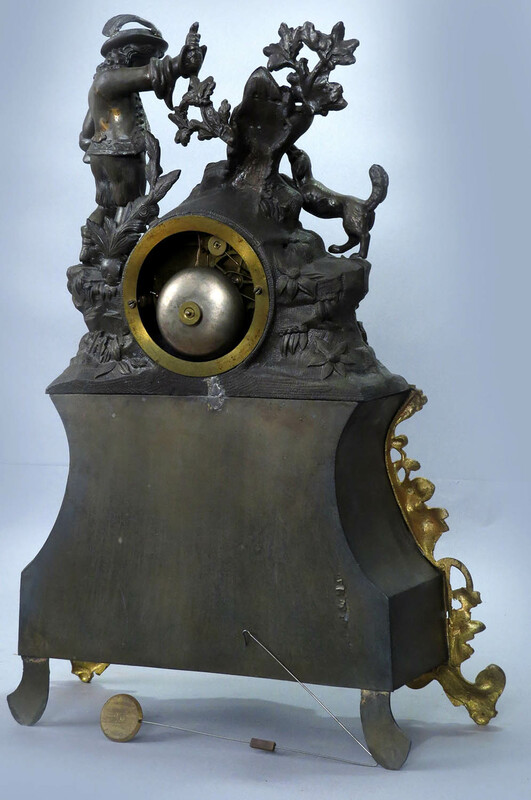 9087 Fine French bronze mantel clock. 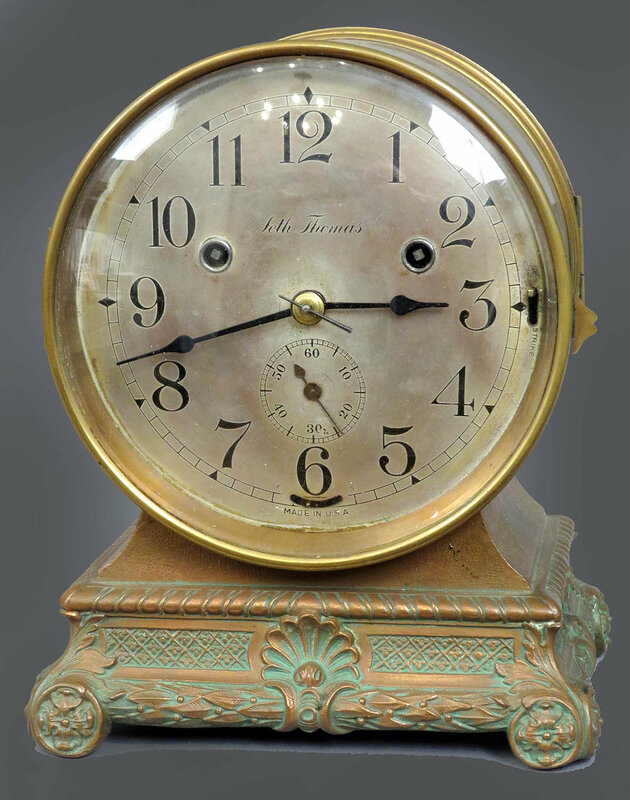 This clock has a beautiful two-toned solid bronze case and it is in near perfect condition. It clearly has been well cared for during its life. The bronze case has a great polished finish and it is accented with a red gold colored strip around the base plus the ornate column capitals. The central dial portion is a scenic painting on bronze and that paint is in great condition. Above that are two hand-painted panels on porcelain. The clock sits on a wooden base which retains the original goldleaf. The hands have been replaced but I am including a good-looking pair of trefoil hands that simply need to be fitted. This is an eight-day clock with hourly strike on a large, resonant cathedral gong. It is running. 9088 Rare Jerome Mfg. Co., New Haven, Conn. 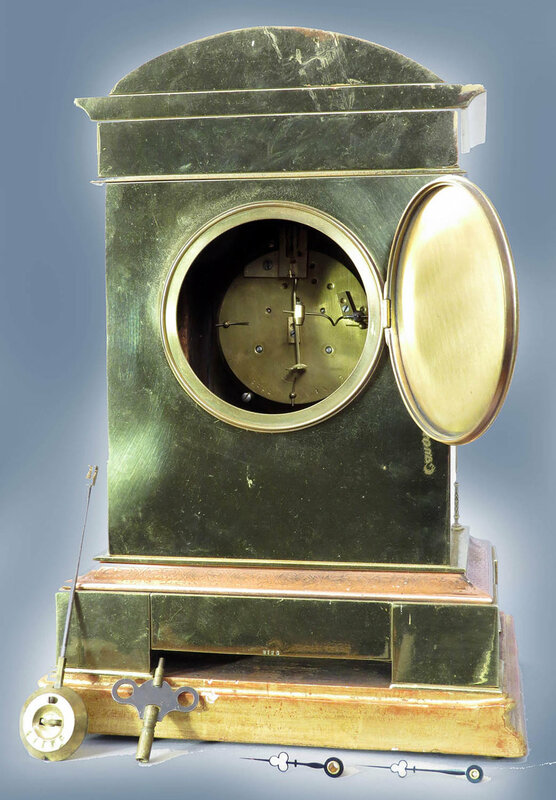 This clock is often referred to as the “Paris” model because that is what is stamped into the front of this pressed brass case. A similar example can be found on page 156 of Chris Bailey’s “Two Hundred Years…” book. The pressed brass portion was overpainted gold a number of years ago but it looks fine just as it is. I believe the black painted wooden base is the original but there is no glass dome. With only one very faint hairline and some small chips at the center arbor, the porcelain dial is in much better condition than average. Because they are so exposed, these dials usually have suffered a great deal of damage. The hands and key are the originals. The hands have been painted gold. This is a one-day timepiece - meaning there is no strike – with a large balance wheel escapement. The last repairman was pretty liberal with his use of clock oil but the clock has been running well for me for several weeks. The escapement has such a large amount of motion that even non-clock people find it interesting to watch. It is also fairly audible. by the Terryville Mfg. Co., Terryville, Conn. This model has a milk-glass base and a gilded wood rim. Note that the bottom edge portion of the milk-glass has been repaired and that repair should show in one of the photos. The wooden rim has lost a fair amount of the original goldleaf. Note also that the clock is shown sitting on a black wooden base. These clocks never came with a base, I simply had it there to make the clock more visible in the photo. It does not go with the clock. The signed dial paper is in quite good condition and the dial retains the original brass rim which is often missing for some reason. The hour hand is correct, the minute hand has been replaced. It comes with an old glass dome of the correct age but it is not original to this clock because it is just a bit small to fit the groove. These are all one-day timepieces. I had it professionally serviced years ago and it was running but it has since come out of adjustment. An illustration of a similar clock is shown on page 126 of Chris Bailey’s “Two Hundred Years…”. 8 ½ inches tall without the dome. $575. 9090 Early French silk thread statuary clock. 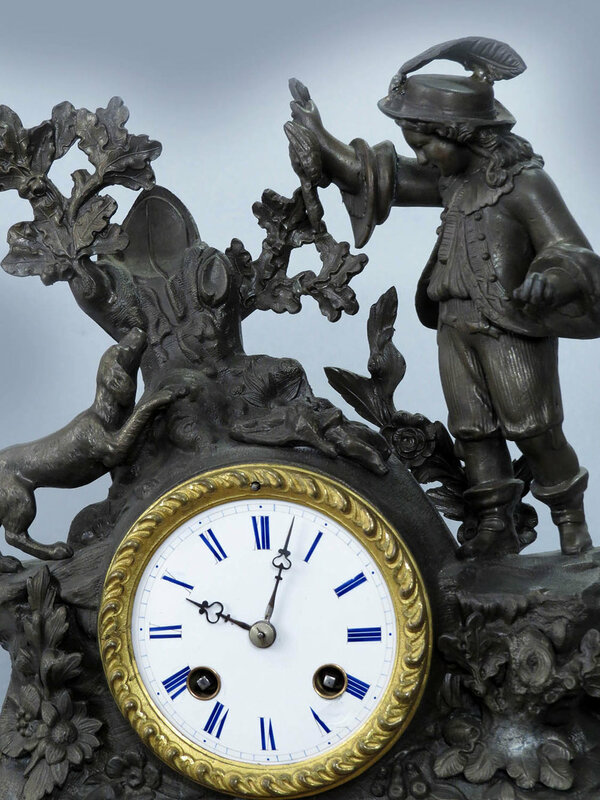 This clock has a cast metal upper portion of a young boy and his dog. I looked it over carefully and did not see any missing pieces. However, the feather on his hat came off at one point and has been glued back into place. 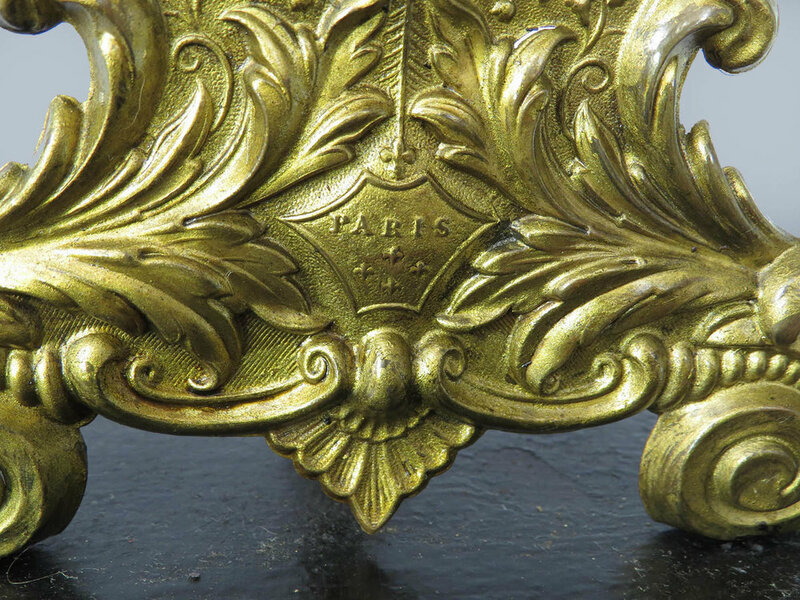 The section below is cast bronze with a fire gilt finish. The condition is excellent and the color shows off nicely against the alabaster panels in the background. There are no damages to the bronze or alabaster. It has a porcelain dial with blue numerals. It is in good condition but for one flake underneath the right winding arbor and that is not very visible. The hands are original while the silk thread pendulum is a modern replacement which will need to be trimmed to the correct length. 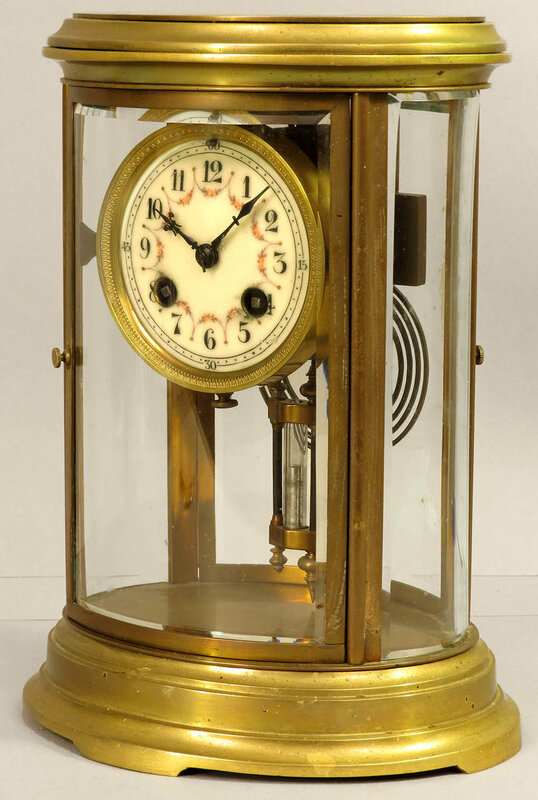 This is an eight-day clock with hourly strike on a delicate bell. Because the pendulum has not been adjusted I have not had it running but the escapement does tick away and the strike train operates properly. 9091 Seth Thomas Tampa bronze mantle clock. This is an unusual, good-looking mantle clock and I do not believe I have owned one before. The upper and lower portions are polished bronze and the central portion has a copper colored finish. The overall condition is very good with only a couple very minor indentations in the very top. The porcelain dial is signed and in very good condition. It has a cast brass bezel and a convex beveled glass. It comes with the original hands and distinctive Seth Thomas brass pendulum. 9092 Ansonia cast-iron mantel clock. This clock has a cast iron case with a textured green finish to resemble marble. The finish is all in good condition. There are bronze colored cast metal trim pieces but note that the very tip of the top ornament is missing. The pressed brass dial with sunburst center is in good condition and all the numerals are crisp. The bezel hinge is loose and needs to be soldered. It retains the original hands and brass pendulum. This is an eight-day clock with hour and half-hour gong strike. It runs a short while before stopping. I could not find this clock illustrated in any of the Seth Thomas books though the Boat and Yacht models are shown with upside down movements. The Cabin model is shown with a standard movement. The upper portion is brass and it is in good condition without any dents or damages. The lower portion of the clock is cast metal with a verde antique bronze finish. All the color is good and there are no damages. It has a heavy cast brass bezel with a convex beveled glass. The silvering on the signed dial does show some wear from years of cleaning. It has a separate seconds dial. There is a fast-slow adjustment beneath the 6 and strike advance lever at the 3. It has the original hands. 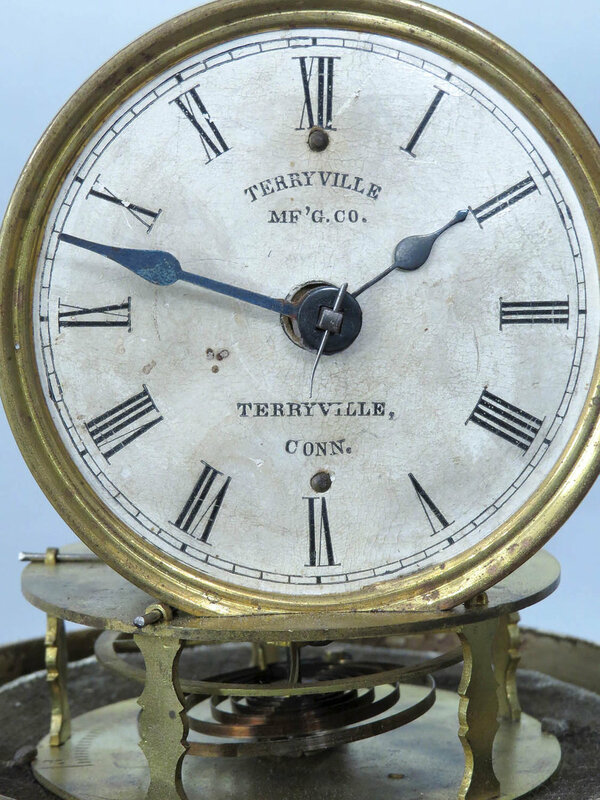 This was probably considered to be a one-day clock but it actually runs about 2 ½ days and strikes ship’s bell time every half hour with double hammers on a single large nickel bell. It has a lever balance movement and seems to be in good running order. 9 ½ inches tall. $285. 9094 Seth Thomas Empire No. 301 crystal regulator clock. This model is illustrated in the 1922 Seth Thomas catalog with a list price of $40. The average wage was about $100 per month at that time so a clock like this was a serious investment. This particular clock is in great condition, running and ready for your shelf. This clock has a solid bronze case with a good finish and no damages. The corner columns are reeded. All four beveled glasses are perfect without any corner chips. The signed porcelain dial is perfect without any hairlines or chips. 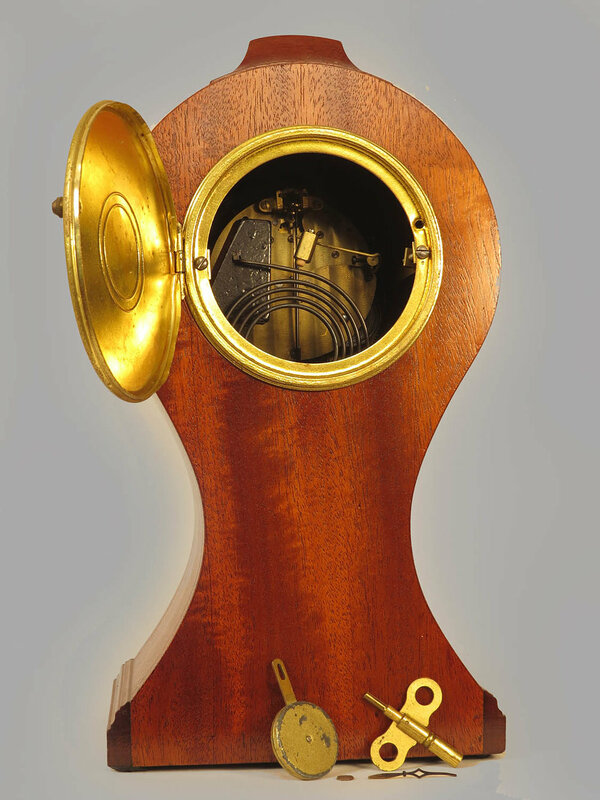 It has a brass dial surround which is finely engraved. 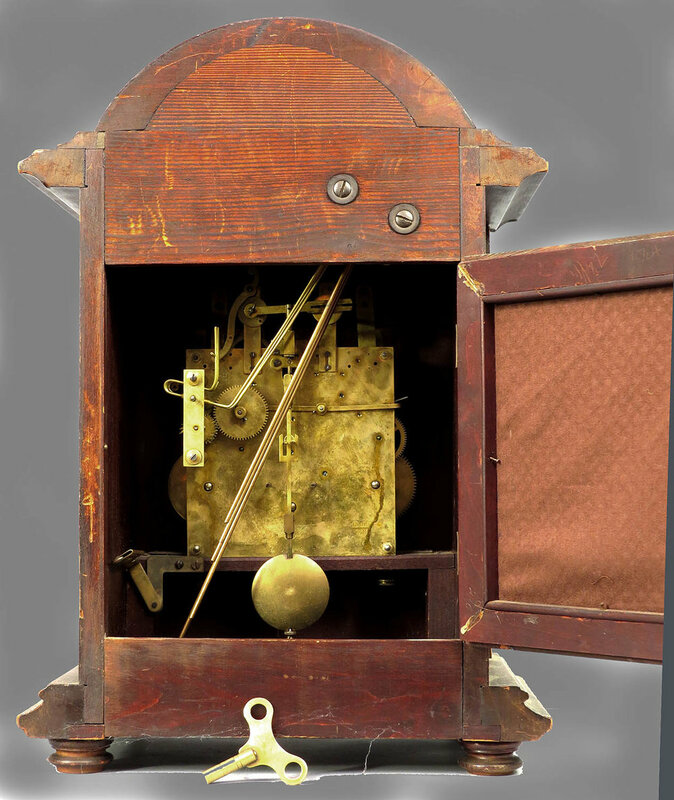 The clock retains the original hands, key and false mercury pendulum. This is an eight-day clock with hour and half-hour strike on a resonant cathedral gong and it is in good running order. The case is solid mahogany and it is in perfect condition under the old finish which would look much better with just a bit of surface cleaning. There are four turned brass feet. The porcelain dial is perfect and it comes with a cast brass bezel and heavy beveled glass. The hands and the pendulum are the originals. This is an eight day model with hourly strike on a gong and half hour strike on a brass bell. The movement appears to be quite clean and in good condition but you will need to check the time side click because it does not catch. 8039 Kienzle Westminster chime mantle clock. This clock has a solid mahogany case with the original finish. The case does not have any damages but it would look much better with a bit of simple cleaning. The arched door has a heavily beveled glass to view the silver and brass dial. You can see that the silvering has some discoloration. 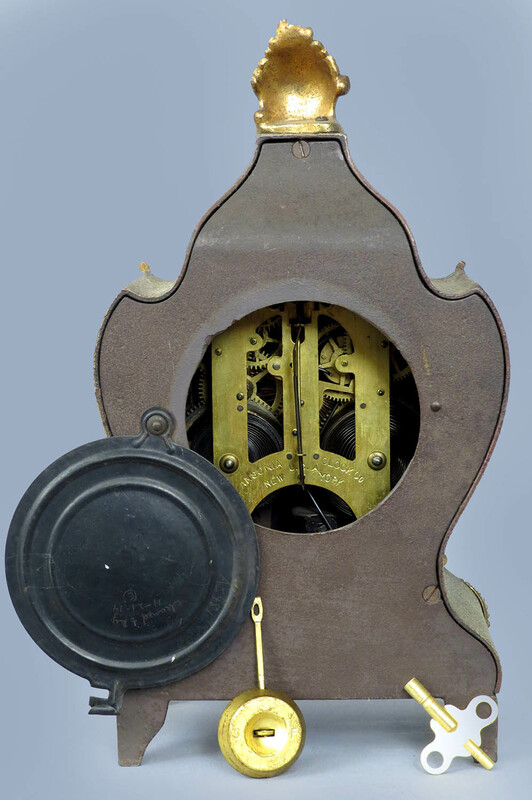 The smaller dials above are for “slow-fast” and “chime-silent”. It comes with the original hands and pendulum plus a proper sized brass key. This is an eight day clock which strikes the quarter hours on 4 rods plus it strikes the hours on a deeper sounding fifth rod. The sound is amplified by the pierced brass panel in the rear door. It has been running for me but I have not taken note if it runs, chimes and strikes for a full eight days. 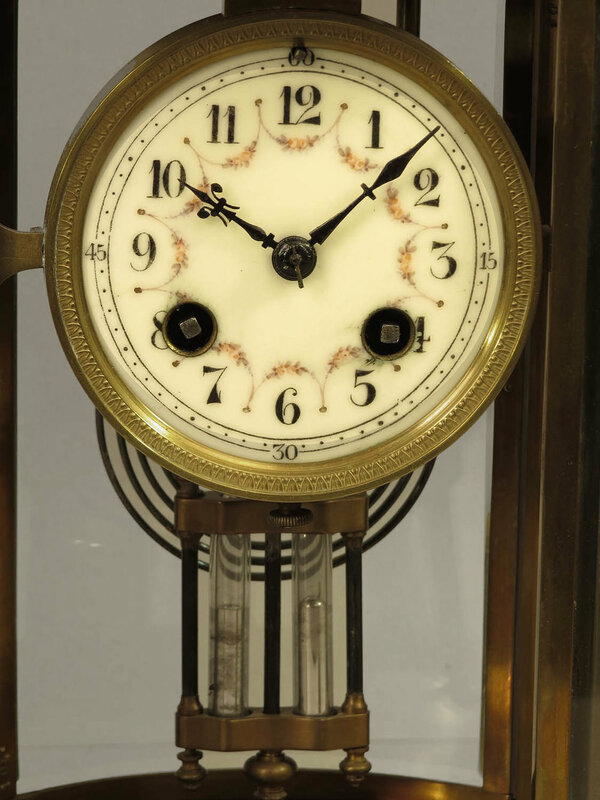 8050 French oval crystal regulator clock. This clock has a nice solid brass oval case. It is very clean but it has not been polished in a while. All four beveled glasses are perfect. It has a colorful porcelain dial which is also perfect without any hairlines or chips. This clock retains the original hands plus a true mercury pendulum. This is an eight day clock with hour and half hour strike on a cathedral gong. It runs a few hours at a time for me and I do not know when it was last serviced. 6024 New Haven balloon clock. This has always remained a popular case style and this one is in good, clean condition. The case is solid mahogany which has been very nicely refinished. I do not see any case damage or problems at all. The signed dial is porcelain with a floral and musical decoration. Notice that there are two hairlines visible at the right side. Sometimes soaking the dial in a cleaner will reduce those lines. The pendulum, key and hour hand are the originals while the minute hand is a replacement. I do have the original minute hand which has been broken but it is complete and could be soldered back together. This is an eight-day clock with hour and half hour strike on a gong. It had been running for me but not for a full week.